Modern Rustic, Country Living's beautiful publication has all you need to create the contemporary country look. This 228-page special publication will build on the success of Country Living’s first two Modern Rustic editions, with more inspiring houses that capture the contemporary country look. It will feature beautiful properties in Italy, Scandinavia and France, as well as Britain, plus profiles of the creative artisans leading the charge and products to buy to create the look. Be the first person to tell us what you think about Country Living Modern Rustic and you'll save $5 on your next purchase! 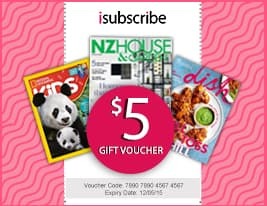 https://www.isubscribe.co.nz/country-living-modern-rustic-digital-subscription.cfm 14509 Country Living Modern Rustic https://www.isubscribe.co.nz/images/covers/nz/541/14509/square/CountryLivingModernRustic202201904653.jpg NZD InStock /Digital/Home & Garden/Decor Modern Rustic, Country Living&apos;s beautiful publication has all you need to create the contemporary country look.